Kirsten Chappa | Common Love: Aesthetics of Becoming in Contemporary Art. Kaira Cabañas (ed). Exhibition catalogue. New York: Miriam and Ira D. Wallach Art Gallery, Columbia University, 2011, 51-63. In contrast with Flame Test's decisive, if fictional, call to action, Kwan's earlier video Displacement (with Chinese Characteristics) (2006) provides a complex view of his ambivalent position within the larger sociopolitical conditions of globalization and forces of socialist capitalism.4 The piece begins with interpolated shots of factory workers, stock traders, and urban-scapes, set to a repetitive soundtrack of incessant machines.5 Rather than seeing the glamorous city that forms part of Shanghai's popular imaginary, the viewer is privy to a problematic setting of both poverty and rapid urban renewal. The archival footage gives way to a present-day scene of young Chinese laborers on a construction site of Kwan's own design. The modest crew, donning brand-name sneakers, jeans, and T-shirts, methodically gathers and arranges the rubble of recently destroyed buildings into what looks like a minimalist sculpture or earthwork. Shot from above, their construction has the eerie sci-fi quality of a crop circle. The monumental scale and use of available materials may also evoke an SOS signal, but here such a gesture of hope becomes a futile call for rescue, as the work—the labor and its product—reinforces the systems that created this inhospitable territory: during the course of the video, the sculptural design reveals itself to be the Bank of China's corporate logo. If Smithson problematized the dichotomies between nature and culture, wilderness and commercial enterprise, Kwan's Displacement similarly points to how capital is not external to the subject: its powerful and insidious forces infiltrate all subjects, artists included, with internalized discipline permeating collective consciousness.10 Kwan foregrounds his dual role as interventionist and complicit perpetrator though the work's structure, which mimics a hierarchical division of labor between those who perform manual labor and those who perform intellectual labor.11 He further reveals his own implicated role as an artist within the marketplace. The final shot of the logo's construction presents an aerial view surrounded by high-rise buildings: it is an advertisement situated in prime real estate. Next, the video cuts to Kwan's studio, where a Chromira print identical to that last aerial shot is framed and packaged, ready for exhibition and sale. Kwan's self-reflexive awareness is here put on display. Displacement creates a situation where the viewer watches the artist, who in turn watches himself. Just as Kwan interrogates labor power within China's socialist-capitalist system, Mika Tajima and New Humans address the post-Fordist shift away from industrial production to immaterial or biopolitical production, which includes information, ideas, knowledge, languages, and software code.12 Their video Dead by Third Act (2008) begins with establishing shots of the historic Lingotto factory in Turin that linger on abandoned interior spaces and Futurist features such as the rooftop racetrack. The climax of the video arrives with a performative destruction of the factory's former product: a Fiat automobile. The car, floor, and tools of demolition were miked, sampled, and amplified during the live sound performance. Standing at the original starting point of the assembly line, New Humans repeatedly beat the car with sledgehammers and smashed nearby pyramids of beverage cans. The artists' violent annihilation of these industrial products goes beyond mere destruction in order to focus on the innovation resulting from their actions. Presented as an audiovisual installation in the Common Love, Aesthetics of Becoming exhibition, the immaterial components of light and sound are foregrounded: the work appears as a single video projection, while the gallery walls function as surfaces for amplification and reverberation of the repetitive sonic patterns, static, and low bass frequencies. Such a reconfiguration forms part of Tajima and New Humans's broader strategy of self-sampling and perpetually delaying the moment of an artwork's completion.13 They insert flexibility and contention into a calcified system in order to resist commodification. Here, the factory space is detourned to destroy the product of a specific ideology, while destruction is also harnessed in the service of a creation that exceeds the boundaries of an individual work. The shift to immaterial production is a harbinger of the increasingly blurry distinction between work and life, a subject taken up by Hardt and Negri.14 According to Hardt, "these newly dominant forms of production bring with them sometimes new and often severe modes of suffering, alienation, and exploitation. "15 In the video Stealing Beauty (2007), Guy Ben-Ner parodies the family sitcom, using various Ikea showrooms as film sets.16 Tense dialogue between husband and wife characters speaks to the pressures and stresses of contemporary laborers. The husband complains about needing to deal with problems at home when he is tired from a long day at the office; the wife is frustrated with the children's behavior; the kids say their parents don't listen to them. (The fictional family is played by Ben-Ner, his former wife, and their two children.) In one scene, the son questions his father about what qualifies as private property; Ben-Ner offers the definition as an exclusive right to use something. A circular discussion ensues, and the children's direct and unabating questions frustrate the father and increasingly test his logic.17 The Ikea setting heightens the infiltration of home life by economic concerns, as multilingual audio announcements from the store's loudspeaker system punctuate scenes, and shoppers walk obliviously in front of the camera. Ben-Ner uses humor to critique and make visible the control and homogenization of the social environment and behavior, as well as the mass-marketing of lifestyles. Indeed, Ikea subtly hawks a false promise of utopia, which is ingrained in its Bauhaus-influenced design aesthetic. Stealing Beauty reveals how corporate design permeates our everyday existence and also governs our habits, from the way we sit to how we groom ourselves, prepare food, and spend our leisure time. Moreover, the video's uneasy conflation of intimate, personal exchanges and a routine shopping experience produces a disorienting effect. The video's editing exacerbates this confusion, synching with repeated interruptions by store security officers, who eject the family from one showroom only to compel their eventual relocation to another. The work allegorizes how the home is falsely perceived as a safe haven from the forces of capital: it speaks both to the packaging of a designer lifestyle and to conditions of migration and impermanence in contemporary dwellings. If Martinez performs elective labor as a social service, his proposal for Common Love, A drainage grate in the city is cleaned and polished (2011), injects an element of perceptual surprise into daily routines, altering, the way an overlooked element of the quotidian environment is seen. For this work, Martinez will sand, clean, and buff a drainage grate on the Columbia University campus until it gleams as if it were made of a precious metal. Giving this ordinary, overlooked object attention and care is a gesture akin to a visual poem demonstrating a commons-loving philosophy. This work also expands outward beyond the campus by engaging the grate as a symbolic vehicle that connects the university to the river, ocean, and other communities. Mads Lynnerup's Tree (2008) is conceived in a similar spirit, although the project intervenes more directly into the larger community, tapping into DIY movements and grassroots organization strategies. With Tree, the artist set out to bridge the gap between the Fischer Landau Center for Art, where the work was presented, and the surrounding Queens neighborhood. The Tree structure, positioned in the art center's courtyard, was tall enough to draw attention from passersby. Envisioned as a meeting spot, the work was outfitted with local newspapers in various languages, modular benches, and snacks and water for sustenance. Gathering the water supply for Tree served as an advertising device and fostered local connections: Lynnerup traveled door-to-door, requesting donations of tap water from members of the community and personally inviting them to visit the project. The piece thus enacted a reciprocal exchange: neighbors gave water as a gift to the artist, while his Tree provided a resource and meeting ground for the community. Dave Arnold's contribution underscores similar issues, furthering the movement toward open forms of information exchange within ever-expanding communities by updating and recontextualizing a regularly practiced mode of circulation. Recipe sharing among family and friends is an example and expression of commons-loving knowledge, operating outside the purview of intellectual property laws. Building on this tradition, Arnold's recipe can be reproduced, shared, and modified by a broader public under academic commons licensing of this catalogue, or through his blog. Furthermore, the experience of making and ingesting Arnold's technological cooking as well as his recipe-as-experiment mirrors the conception of common love as a transformative becoming-other. Existing in the realm of free idea exchange and in the kitchen, his proposal for the use of gymnemic acid, which modifies our ability to taste sweets, stands to alter our expectations, eating habits, and social behaviors. Although artists are implicated parties operating within the global economy, they occupy a unique position in the work force, possessing the "immaterial" assets of creativity, collaboration, and unconventionality. These resources can be harnessed to raise consciousness, encourage critical dialogue, and interrupt chronic patterns in order to instigate change from within. Producing new work involves a strategic set of tactical maneuvers; the goal is to stay one step ahead and push the envelope of what is possible before creative output is co-opted by capitalism. Artists, as intellectual and physical laborers, are especially poised to level a challenge toward oppressive systems of control. By assessing the tools and materials of capital, they hold the power to redirect these symbols and structures toward existing system, thereby fighting fire with fire. 1 Hardt and Negri, Commonwealth, 182. 3 Today, as workers, goods, and services circulate across arguably outmoded municipal boundaries, these borders are increasingly policed. That is, globalization's promise of connectivity and prosperity is premised on maintaining boundaries, both physical and psychological. Yet this reshaping of borders has opened onto an increased awareness and dialogue around the colonization, exploitation, and privatization of our common natural, cultural, and knowledge-based resources that rightfully belong to society at large. 4 On China's incorporation of a capitalist organization of labor, see Hardt and Negri, Commonwealth, 91-93. 5 The audio begins as a beating accompaniment signaling the forward march of progress, and later becomes warped, creating a drugged atmosphere that mimics the dusty haze veiling images of massive construction projects. 6 Quoted in Kirk Johnson, "Plans to Mix Oil Drilling and Art Clash in Utah," New York Times, 27 March 2008. 7 Smithson chose the Rozel Point site in Box Elder County, Utah, for Spiral jetty because of the complex matrix of interests that were then nascent to the site. When the work was constructed in 1970, its location was relatively uninhabited, but tensions have amplified over the past thirty-six years. Several battles of public, private, and common interests have been fought, with Spiral Jetty itself a lightning rod for debate. The Dia Art Foundation, guardians of the piece, have partnered with various environmental agencies in the interest of protecting both the long-term installation and the fragile ecosystem of the lake. See "Robert Smithson: Spiral Jetty," Dia Art Foundation website, http://www.diaart.org/sites/page/s9/1245 (accessed 7 August 2010). 8 Other commonalities include how both works exist in three formats: as cinema, photography, and the earthworks themselves. 9 See Robert Smithson, "The Spiral Jetty," in Robert Smithson: The Collected Writings, ed. Jack Flam (Berkeley and Los Angeles: University of California Press, 1996), 152-53. 10 Displacement can thus be viewed in relation to biopolitical power and the transition from a society of externally enforced discipline to one of internalized control. Michael Hardt and Antonio Negri's discussion of biopower builds upon the Deleuzean interpretation of Michel Foucault's ideas. See Hardt and Negri, Empire, 23-24; Gilles Deleuze, Foucault (Paris: Minuit, 1986); idem, "Post-scriptum sur les sociétés de contrôle," in Pourparlers (Paris: Minuit, 1990), 240-47. 11 For a nuanced definition of capital beyond the mere accumulation of wealth to include its propagation through the exploitation of labor, see Hardt and Negri, Commonwealth, 139. 12 See Michael Hardt, "Production and Distribution of the Common: A Few Questions for the Artist," Open 16 (2009), 23-24. 13 The piece was first staged as an installation consisting of the Fiat car, sheets of mirrored glass, and beverage cans, then performed as a sonic experience, and later presented as audiovisual installations with flexible orientations. By presenting multiple iterations of this work, the artists resist the logic of scarcity that typically accompanies material goods, illustrating that the endpoint of production is no longer the mere commodity. 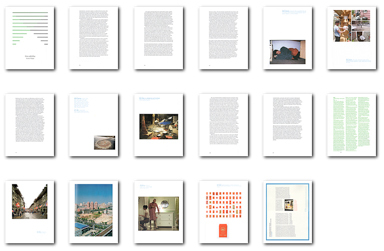 For a discussion of similar strategies in contemporary artistic practice, see Liam Gillick, "The Good of Work," e-flux, May 2010, http://www.eflux.com/journal/ view/142 (accessed 7 August 2010). 14 Liam Gillick also addresses this condition in "The Good of Work." 15 Hardt, "Production and Distribution of the Common," 24. 16 Stealing Beauty was shot in several international Ikea locations: Berlin, New York, and Tel Aviv—a nod to corporate expansion within our globalized world. 17 For example, the son asks his father how they came to own their house, and how the people before them came to own it, and so on. The daughter wonders if their mother and they themselves would qualify as private property. 18 Marcel Mauss, The Gift: The Form and Reason for Exchange in Archaic Societies, trans. W. D. Halls (New York and London: Routledge, 1990), 73-74; originally published as "Essai sur le don. Forme et raison de l'échange dans les sociétés archaïques," in L'Année sociologique, 1923-24. 19 For an additional discussion of Endless Prosperity, Eternal Accumulation, see the Round Table included in this volume, pp. 94-101. 20 Hardt and Negri, Commonwealth, 139. 21 Judith Butler discusses precarity in terms of the conditions that make the production of subjectivity possible and "the ethical problem of what it is to acknowledge or… to guard against injury and violence." See Judith Butler, Frames of War: When Is Life Grievable? (London and New York: Verso, 2009), 3-4. 22 As much as Martinez's work is a selfless act of gift giving, one could also argue that he ultimately presents these pieces for his own gain. Such a conflict is addressed by Marcel Mauss, who writes: "The producer who carries on exchange feels… that he is exchanging more than a product of hours of working time… but that he is giving something of himself—his time, his life. Thus he wishes to be rewarded, even if only moderately, for this gift. To refuse him this reward is to make him become idle or less productive." Mauss, Gift, 77.